Gareth Southgate's latest England squad may have a familiar feel to it, but a group of players will be looking to change that picture. Saturday's Uefa Nations League game against Spain and Tuesday's friendly with Switzerland are opportunities for five players to remind Southgate - and England fans - that they should be central to the future of the Three Lions. So who can make an impact and benefit the most from an impressive few days with the national side? England's left flank was always likely to open up after the World Cup as manager Gareth Southgate looked away from 33-year-old Ashley Young and forward into the future. Tottenham's Danny Rose did not make a compelling case to be the automatic replacement so the revival of one of England's one-time great hopes has been timely for Gareth Southgate. During a difficult start to the season for Manchester United, Luke Shaw has been one of their standout performers. He has looked the player who, while at Southampton, was given his England debut as an 18-year-old against Denmark in March 2014, before going to the World Cup in Brazil. This was followed by a £30m move to Manchester United but his career stalled when he broke a leg in a Champions League defeat at PSV Eindhoven - and then by an uneasy relationship with club manager Jose Mourinho. Shaw's defensive performances often appeared to irritate Mourinho but such has been his return to form this season that he has been an automatic choice. He was the first player the manager went to after August's 3-0 home defeat by Tottenham - with Mourinho offering him a warm embrace and words of praise. He returns to this England squad with confidence and fitness renewed, back to his best and with a vacancy available if he gets the chance to impress. This is a big few days for Shaw, who last played for England in the 1-0 defeat by Germany in Dortmund in March 2017. Jack Butland had hopes of being England's number one at the World Cup in Russia. Southgate decided to go with Everton's Jordan Pickford, who had an outstanding tournament. It will have been a serious disappointment for Butland but he earned respect with his support for Pickford and willingness to accept a secondary role. And to add to his frustration, the 25-year-old is now playing in the Championship after Stoke City's relegation, and Chelsea and Liverpool went abroad for their new first-choice keepers. There was even a question about whether Butland's demotion to Championship duty may count against him for Southgate's first post-World Cup selection. The keeper, however, is regarded highly by Southgate in terms of character and ability. It has been a tough start for Butland and Stoke in the second tier as they lie 18th after three defeats in their first six games. Butland, out of that Championship bubble, will be desperate to shine this week - not just to reinforce a message to Southgate but perhaps also remind potential suitors of his Premier League quality. Joe Gomez could have been at the World Cup but for an ankle injury suffered in England's March friendly against the Netherlands - now he is back and manager Southgate will be delighted. The 21-year-old looked every inch an international footballer on his England debut against Germany at Wembley in November 2017. Having regained fitness, and with dejan Lovren injured, Gomez has been slotted in alongside Virgil van Dijk at the heart of Liverpool's defence, and he has been outstanding in their 100% start to the season. Gomez is the identikit modern defender. Athletic, powerful, composed, hard-edged and with real pace. He also has another crucial asset that always endears players to Southgate - he is adaptable. He can play at right-back and certainly on the right side of a three-man defence, an experiment that enjoyed a measure of success with Kyle Walker in Russia. Marcus Rashford needs something to kick-start his season. He made only one start at the World Cup, in the final group game against Belgium, and has been marginalised at Manchester United. Rashford has not started a United game since being substituted on the Premier League's opening weekend against Leicester. Perhaps some of that early-season frustration bubbled over when he was sent off for thrusting his head into Phil Bardsley's face in the win at Burnley last Sunday. Rashford, however, remains a rare talent at his best and at 20 this is a career still in its infancy. He has won 25 England caps but only nine as a starter. 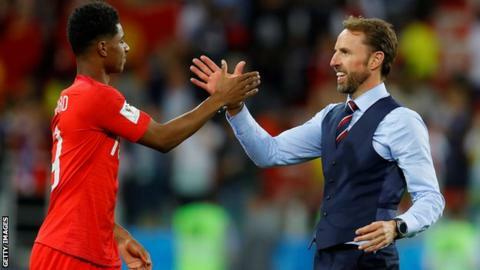 He is a player Southgate will surely count on in the qualifying campaign for Euro 2020 and he can make himself the beneficiary of Raheem Sterling's absence from this squad through injury. And Southgate may also be the beneficiary of Rashford's release from his current Manchester United struggles. Ruben Loftus-Cheek, at just 22, is reaching a crucial face of his career both with England and Chelsea. Loftus-Cheek, who started his international career with a man-of-the-match performance against Germany in November 2017, impressed in cameo performances at the World Cup, and will be looking to push on this season. Southgate's search for a significant creative influence in midfield goes on and this tall, powerful and elegant youngster has shown in spells for England - and during a successful loan stint at Crystal Palace last season - that he has the gifts to grow into this role. The problem is, however, lack of game time. Loftus-Cheek would have been a target for many clubs had they been given encouragement that he might leave Stamford Bridge in the summer. Instead he stayed, and so far the decision has not borne fruit. While new Chelsea manager Maurizio Sarri spoke highly of his qualities, he believes Loftus-Cheek needs to improve tactically and Ross Barkley, a forgotten man for England for more than two years, even got the nod ahead of him for Chelsea's early games. He has played just 33 minutes this season - and that is not enough. He will want to use these England games as a showcase. Getting game time - the biggest threat to England's future? Read more on England: Players getting game time - the biggest threat to future?